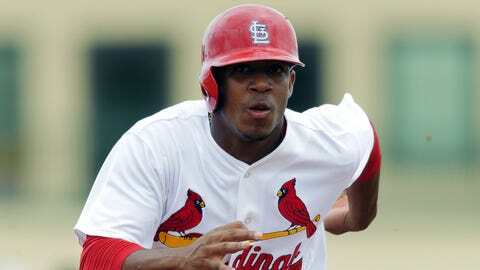 Cardinals top prospect Oscar Taveras was sidelined for much of last season with an ankle injury. LAKE BUENA VISTA, Fla. — Almost four months since undergoing surgery on his right ankle, the Cardinals believe top prospect Oscar Taveras will be 100 percent healthy by spring training. Taveras was not cleared to start running after being examined in St. Louis over the weekend but he continues to progress at a pace that satisfies the Cardinals. Taveras injured his ankle in May and was limited much of the season. He finished with a .306 average, five homers and 32 RBIs in 48 games for Class AAA Memphis. He was sidelined twice after the injury and eventually shut down for the season in July. Still, the 21-year-old outfielder “should be ready by Day One” of spring training, Mozeliak said. Taveras returned to his home in the Dominican Republic after visiting St. Louis but is expected to return next month for another checkup and perhaps attend the Winter Warmup. An update on new center fielder Peter Bourjos following a weekend visit also was encouraging, Mozeliak said. Bourjos, who underwent right wrist surgery in September, has started hitting in Arizona. On Nov. 22, the day he was traded from the Angels, Bourjos said he would be cleared to swing within a couple of weeks. Mozeliak spent most of his media session offering medical updates because there wasn’t much hot-stove business to discuss. The Cardinals already have completed most of the off-season work by trading for Bourjos and signing free-agent shortstop Jhonny Peralta. All that’s left is finding a right-handed-hitting backup infielder, but Mozeliak isn’t in a rush to complete a deal at the Winter Meetings. Mozeliak added that he expects to name a replacement for assistant hitting coach Bengie Molina by the end of the week. The GM said he reached out but had not talked with Tony La Russa following the long-time manager’s Hall of Fame election Monday. Though the two didn’t speak, Mozeliak did see La Russa doing an interview in the main lobby at the Swan and Dolphin Resort. “I walked right by him on TV but it was too crazy (to photo bomb),” Mozeliak said.